The 2030 Agenda for Sustainable Development, adopted at the 70th session of the United Nations General Assembly in 2015, set bold goals to shift the world onto a sustainable, resilient path. Also pledged was the formation of a revitalized Global Partnership for Sustainable Development including all countries, all stakeholders and all people, such that no one would be left behind. Taiwan, though not being allowed to participate in the UN’s meetings, activities, and mechanisms, has never shirked its duties as a responsible stakeholder. In line with the Agenda’s recommendation, Taiwan released its first Voluntary National Review last year, detailing our whole-of-government approach to implementing the UN Sustainable Development Goals (SDGs). The concrete results we have achieved include alleviating poverty, zero hunger, reducing the percentage of low-income households to under 2 percent, cutting the maternal mortality rate to just 11.6 per 100,000 people and under-five child mortality rate to just 2.4 per 1,000, and improving our literacy rate to 98.7 percent. All of these are well above UN SDG standards. Taiwan also provides development assistance to other countries. Through the International Cooperation and Development Fund (TaiwanICDF), Taiwan’s official development assistance organization, we have launched various programs in the Pacific, Asia, Africa, Latin America, and the Caribbean. These programs aim to help countries in these regions to achieve clean energy, food security, food safety, sustainable agriculture, better education, health and well-being for all age groups, and disaster reduction and adaptation. TaiwanICDF also works with the European Bank for Reconstruction and Development to assist countries in Central Asia and Central and Eastern Europe to develop market economies and a green economy. 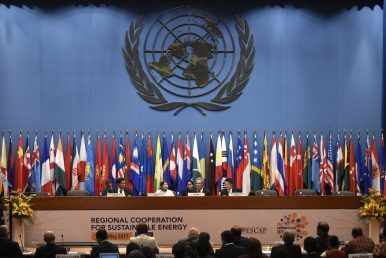 While Taiwan’s valuable contributions have been widely acclaimed around the globe, the UN continues to ignore what Taiwan can offer. Taiwan’s tourists, experts, and professionals are denied entry into UN premises simply because the UN does not accept the Republic of China (Taiwan) passport, which is recognized by almost every country in the world. The UN has refused to accredit Taiwan’s journalists covering its meetings and activities, yet the work of such people is in the interests of the people of Taiwan and the world. We are extremely disappointed that the UN continues to misuse 1971’s General Assembly Resolution 2758 (XXVI) to justify Taiwan’s exclusion and isolation. As we have pointed out before, this resolution neither addresses the issue of representation of Taiwan and its people in the UN system, nor defines the relationship between Taiwan and China. The so-called “one China” principle has been challenged by many UN member states. It is wrong for the UN, an organization created to serve all of humankind, to unilaterally define Taiwan’s status. Article 1 of the UN Charter proclaims that the purposes of the organization are to “achieve international cooperation in solving international problems of an economic, social, cultural, and humanitarian character, and in promoting and encouraging respect for human rights.” At this critical juncture when humankind is facing multiple challenges, global cooperation that includes all countries, all stakeholders, and all people is ever more important. By excluding a willing and able partner like Taiwan, the UN not only violates the fundamental human rights of Taiwan’s 23 million people but also greatly harms human welfare. To ensure the UN remains relevant to all people, the organization should stand up to external pressures and open its doors to Taiwan. How can the International Labor Organisation promote social justice while cozying up to political forces?